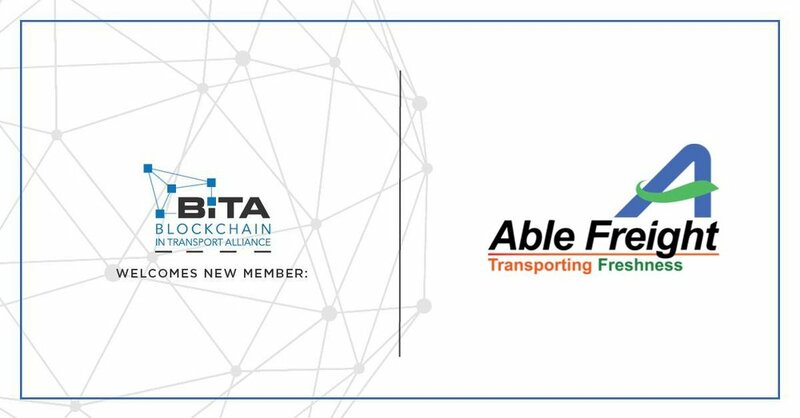 Able Freight Services, a leading global cold chain logistics provider with 25 years in business, today announced it has joined the Blockchain in Transportation Alliance (BiTA), an organization dedicated to determining best practices and standards for blockchain in the transportation industry. BiTA’s members include Descartes, Daimler, FedEx, SAP and Uber Freight among dozens of other global brands. Able Freight will bring its deep expertise in cold chain (perishables) logistics to the Alliance and help develop Blockchain-based solutions within such segment, which is showing significant growth and market interest over the last few years. Blockchain is a technology that enables identifying and tracking transactions digitally and sharing this information across a distributed network of computers. For the transportation industry, Blockchain allows the ability to more effectively track goods and freight across the supply chain. Blockchain will allow transportation and logistics companies to operate in a more seamless and transparent manner. It can also help to create new revenue streams and value for customers by enabling a system of completing transactions, tracking shipments, and managing fleets. Able Freight has already developed and launched its own customer portal called “DataHub” for perishables shipments. It’s a web and mobile-based platform containing real-time shipment tracking, access to all shipment documents on both sides from shipper to consignee and instant data visibility about location, temperature and humidity of your cargo. The portal soon will also offer commodity-based shelf-life predictions for your shipments to actively control, plan and deliver the perfect product to the final client! BiTA was formed in August 2017 by experienced technology and transportation executives to create a forum for the development of Blockchain standards and education for the freight industry. It brings together leading companies in the freight technology industries that share a vested interest in the development of Blockchain technology. BiTA engages with the industry and provides educational resources to promote the potential benefits of Blockchain technology. Over 1,000 companies have applied for membership. For more information about BiTA, please see https://bita.studio. Whether you are a produce grower, broker, or international corporation, Able Freight has the perfect solution for your business. We are global experts in handling perishable commodities imported and exported from the United States to destinations worldwide. We create competitive advantages for our customers by offering unique solutions and access to proprietary technology. Able Freight handles products with precision. 99.99951% of shipments are free of any claims. We export over 75,000 tons of perishables annually, enough to fill over 750 Boeing 747s. Many of the world’s most recognized brands trust Able Freight with their shipments. Day or night dedicated professionals at Able Freight are always on the job. Our 25 years in the business and hundreds of years of collective employee experience means you benefit from industry-leading knowledge, responsiveness and innovative solutions.